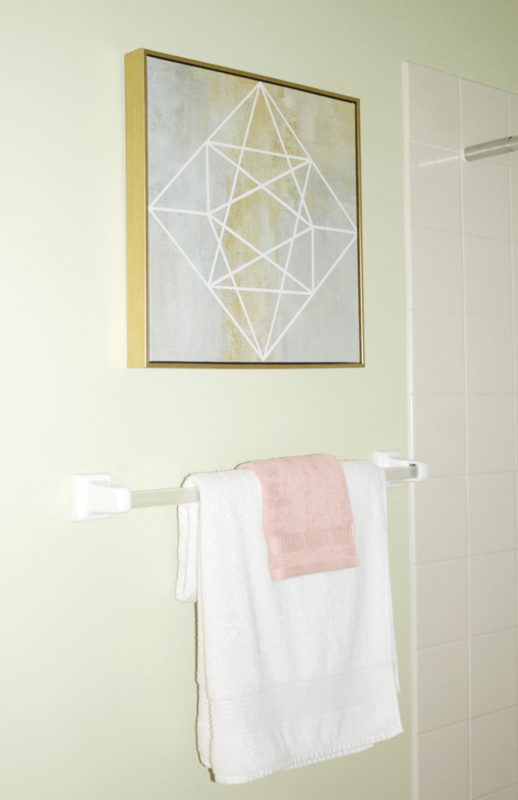 Our downstairs bathroom got some modern touches for a quick summer refresh and we’re loving it! It’s our most used bathroom in the house because it is on the first floor (AKA the hangout floor). Which means it’s not only used by us but also by those who visit. Since moving here, I’ve already added a shower curtain and organized this bathroom. That’s been such a big help. But the plain walls and vanity sink accessories were some things I wanted to change. In fact, recently I was taking inventory of how I could make all our bathrooms pretty and functionally organized (there are four full ones)! While I really wanted to work on our Master bathroom for this refresh, it made sense to try to finish one bathroom at a time rather than jumping all over the place, leaving things half-finished. Clean Lines – Modern decorating takes on a clean approach. Lines are cut straight and spaces are generally neutral and opened to provide an airy feel. I know this bathroom is tiny and does not have an all out modern design, but it’s not far from it. I’m was only focusing on a quick refresh and not a remodel so ding my best to make it feel light and airy was key. Less is More – Less is more when considering a modern approach to decorating your bathroom. A tiny bathroom do not need a lot of decor. The less ‘things’ you display, the bigger your bathroom would look and feel. 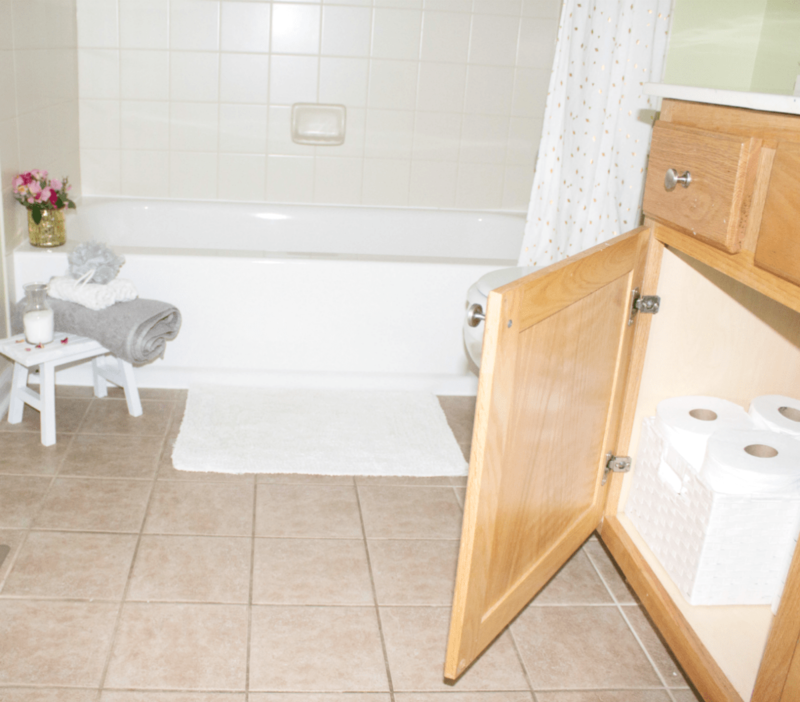 Clutter could accumulate very quickly in a tiny bathroom. 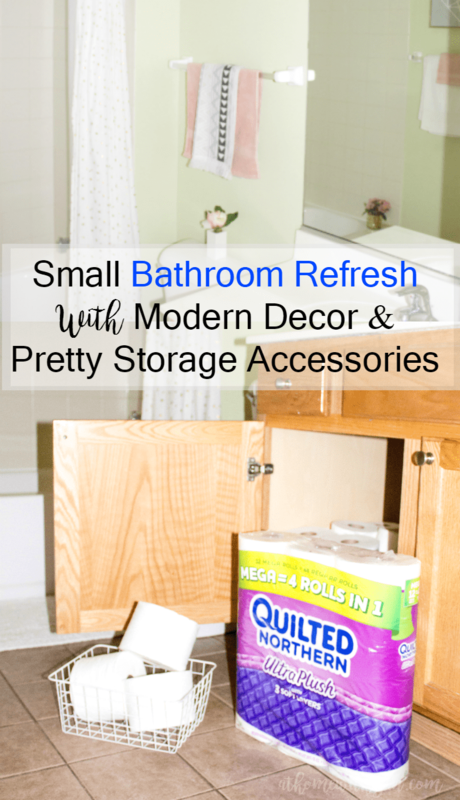 Think about creative ways to store necessities without making the bathroom feel over-crowded with nick-nacks everywhere. Not boring – Modern bathroom decorating does not equal boring decorating. Add an accent towel or two, pretty storage, or some pretty flowers to add a pop of color and to brighten up the room. 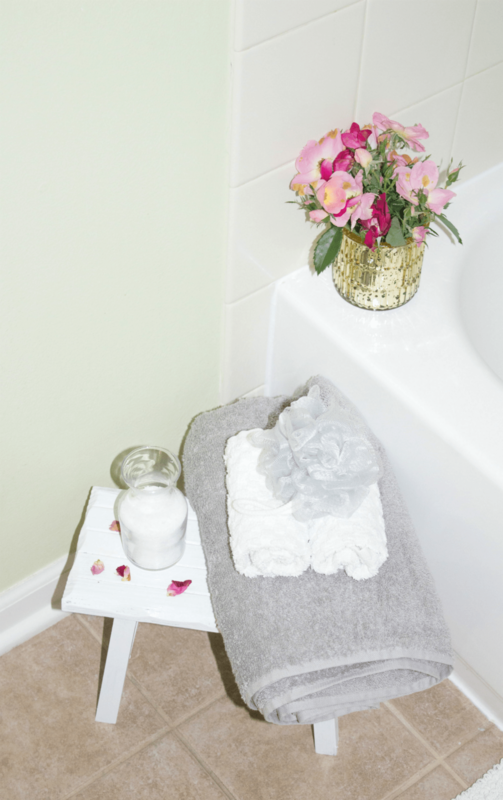 Think about your bathroom as a sanctuary or retreat after a long tiring day and use all things in moderation. I found everything I needed for our bathroom refresh at Target! It’s no surprise! We’re ALWAYS there and during our many trips, I always see some fabulous bathroom decor that I think would really pull our bathrooms together. So I knew they’d have everything I needed to decorate and add some pretty functional organization to this one. I’m all about one-stop-shopping when I have three small kids in tow. It’s so much easier than having to load them up in the car and take them back out three or four times just to find what I need. I based the color pallet and patterns around the shower curtain, previously purchased at Target. I was not ready to change it out; it really is lovely. I tried my hardest to get the best shots – why are bathrooms so difficult to photograph, ya’ll? While at Target, I also picked up two packs of Quilted Northern® Ultra Soft & Strong Mega Rolls of toilet paper. 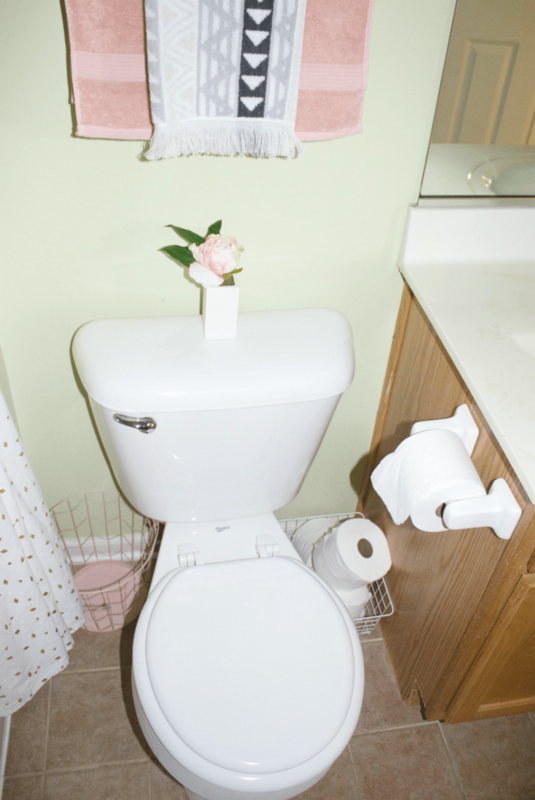 Because what bathroom refresh is complete without toilet tissue? LOL! It’s the one bathroom item we always have to stock up on but it’s also the one item we tend to run out off (at least in one bathroom) before heading to the store. Every so often, we’ll have to grab a roll or two from one bathroom to use in another until that store run. During the summer, we are always finding ways to make things run smoothly so we can spend as much time in the sun as possible. But there are times we would be outside in the front or backyard playing and inevitably, someone would have to go inside to use the potty. And then I would hear a tiny voice saying something like, “mommyyyyy, there’s no toilet paper!” That means, I’ll have to gather all the kids and take them inside or send a kid inside just to find an extra roll. 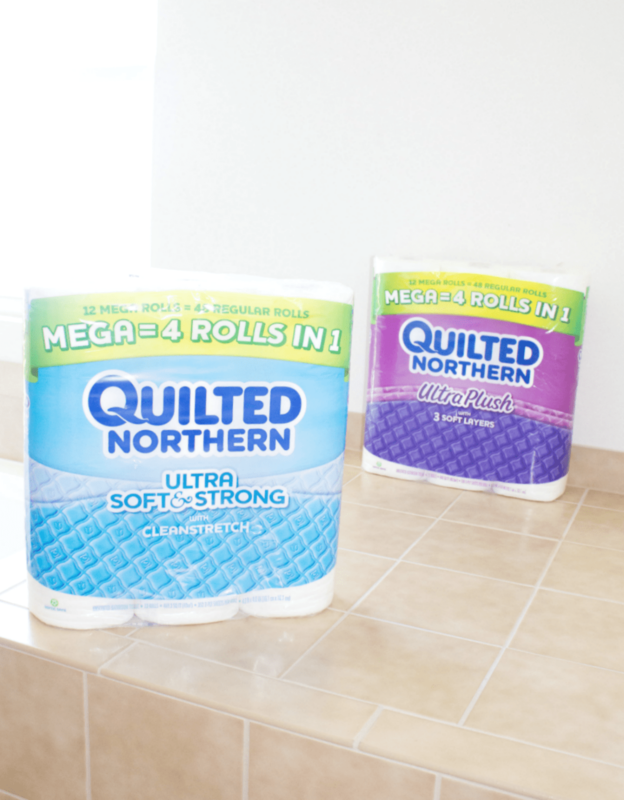 Quilted Northern Mega Rolls are much more fuller than the regular rolls. Each roll is equivalent to 4 rolls in one. That means, you get more for your money plus less worrying about having to change the rolls ALL THE TIME. You may have remembered my post about Quilted Northern Mega Rolls here. Currently, we also have a family guest who tends to use a ton of toilet paper. And I’m not kidding! It’s one of the items I knew I would have to stock up on before she arrived. I actually bought an entire pack of rolls just for that guest bathroom and it feels great not have to worry about it. Added a Piece of Modern Art and a Beautiful Wall Clock – I think this piece of art just had to come home with us. I walked the art isles a few times (not knowing exactly what I was looking for). I had picked up something previously but knew I should look carefully at least one more time. This framed canvas was exactly what I needed to pull the colors together. It was confirmation that the grey and gold pallet I was going for really works. Yes! It actually comes in a set of two. This one was by itself and one of the managers mentioned that someone may have taken out the other one (since it’s no where to be found). She sold it to me for half the price of two. I only needed one since the bathroom is already so small. Too much art on the walls would make it look and feel even smaller. The beautiful golden clock on the opposite side was another awesome find that compliments this piece of art and for telling the time, of course. The colors really blend nicely and pulls the room together well. Used Pretty Storage to Corral & Organize Items – This bathroom holds all things skin and hair care. It’s so easy to grab something on the way out rather than having to head upstairs, you know. We tend to buy at least two or more of whatever skin care product we need – one for our bathrooms upstairs and one for downstairs. It may sound kind of silly maybe but it saves us so much time when we are trying to hurry out the door, rather than having to go back upstairs to find what we need. The problem is that it can become unorganized pretty quickly. I’ve been using baskets to corral these products plus all the extras under the sink and glass jars for tooth brushes and hand soap on the vanity. I’ve been wanting to switch out the jars for something more “classy” and this toothbrush holder and soap dispenser set is exactly what I needed. 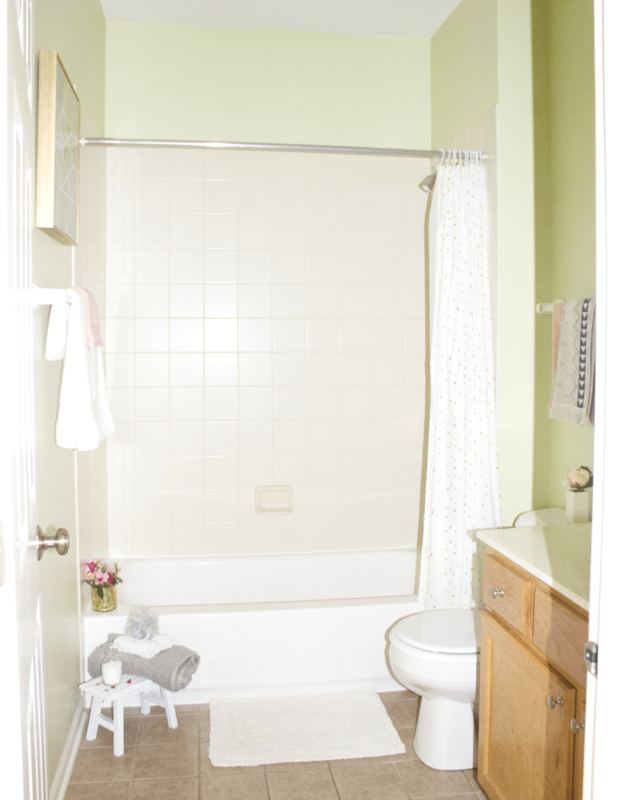 Changed out towels – It is amazing how changing out the towels in a bathroom could instantly make it look like a new bathroom. While I was changing out the towels in this bathroom, the kids walked in and said it looked like a new bathroom. I couldn’t agree more. Added Pretty Flowers – Flowers add instant beauty to any room. These are faux but the good thing is that the bathroom now has it’s own little pretty, at all times. I wouldn’t have to worry about changing it out every few days. I also love mixing faux flowers with fresh. My fresh cut roses are from the yard. I placed them in a candle holder I also got from Target a while ago. It did the trick! Having a pretty and refreshed bathroom always gives me that desire to soak in the tub. Especially on those long summer days when we’ve been outside all day and I want to relax my tired muscles and have a good soak. I’m not the only one who love soaking in the tub around here. Even the kids love it. But a good soak is really not fun if the bathroom is disorganized and quite messy. It’s why I’m always looking for ways to make it clutter free and just the right place to relax after a tiring day. If you’re stuck in a route not knowing how to make your small bathroom pretty and functional, I hope these tips would help you. 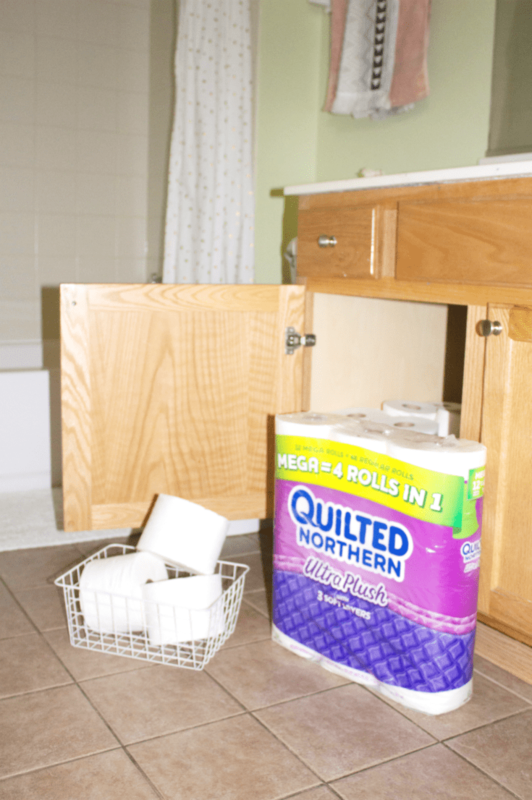 Also, don’t forget to stock up on Quilted Northern Mega Rolls so you don’t run out of toilet paper all the time. And if you have guests and visitors during the summer months, you know you will need the extra. 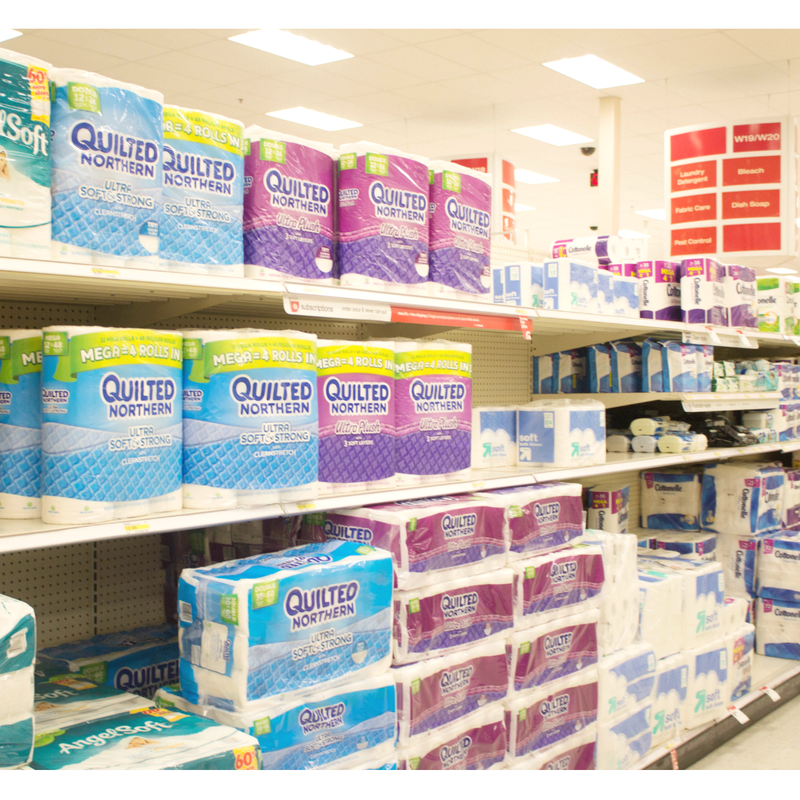 Download the Target Cartwheel app, to save 10% off Quilted Northern Mega Toilet Paper on Cartwheel 6/20-7/8. And if you buy 3 Packs of Quilted Northern Mega Toilet Paper, you’ll get a $5 Target Gift Card (valid 6/18-6/24.) Those Target gift cards really do come in handy. You can also check out these Quilted Northern character-inspired bathroom [Daddy Gator, Little Miss Puffy Tail & Sir Froggy] and vote for a chance to win a $1,000 Grand Prize or $250 Target Gift Card! Sweepstakes runs from 6/19-8/1.” Click here to vote. Could your bathroom use a little refresh this summer? 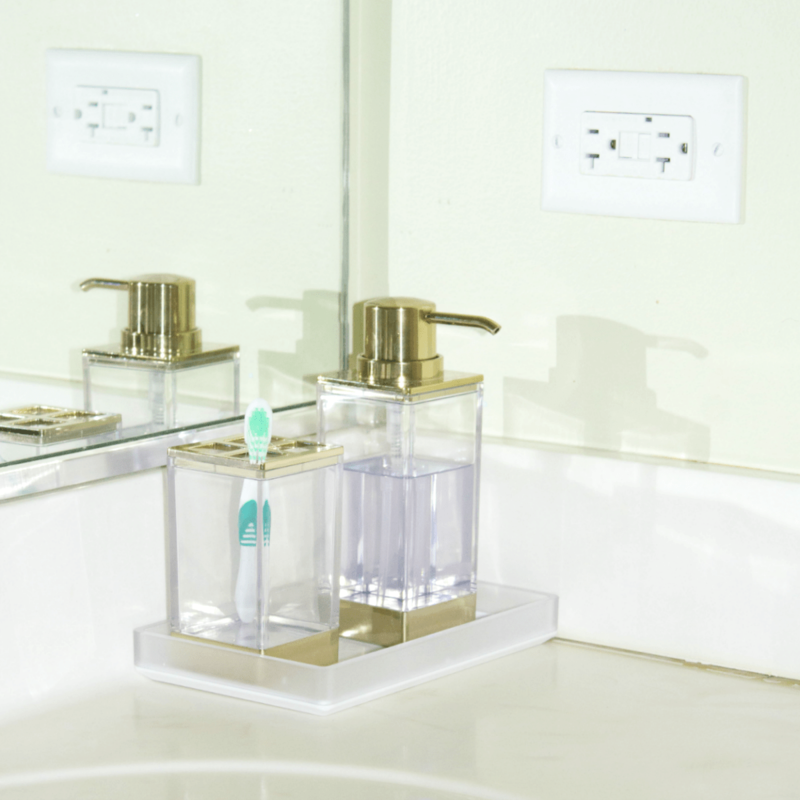 I’d love to know how you keep things organized while still pretty in your bathroom. I love all the decor in the bathroom! The little footstool with the towel is so cute! I know right! I found everything at Target to refresh the space!! Simple and sweet. Doesn’t over do it but still looks amazing. I love it! Great decor! Thank you Nikki! Glad you like it!! The bathroom looks awesome! It’s so true “less is more” — even the tiniest changes in decor can make all the difference. You made the space look bright, fresh and new! Love these ideas!! Thanks a bunch Brooke!!! 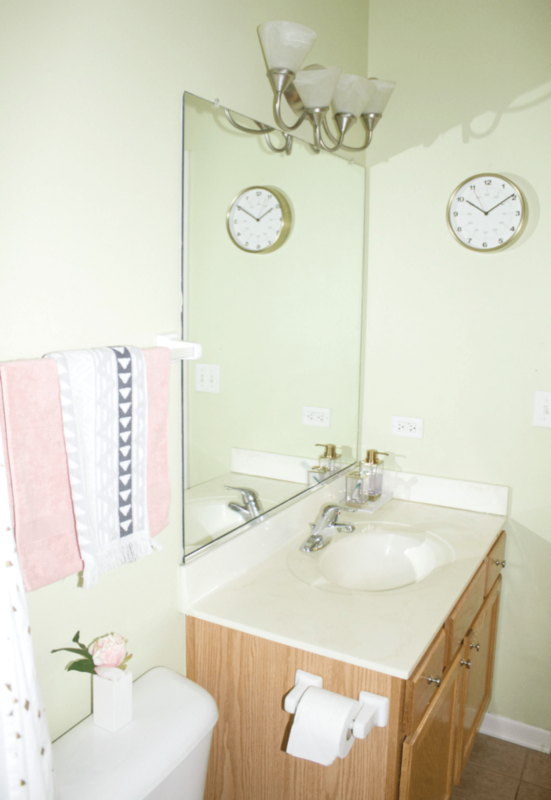 Tiny bathrooms (and big ones too) tend to get cluttered. Having some storage to corral things and keeping less out is always a great way to reduce that clutter. Love the fresh new look! Love these pretty touches! These are great modern accessories. Yes, they are! Target really has some pretty bathroom stuff!! 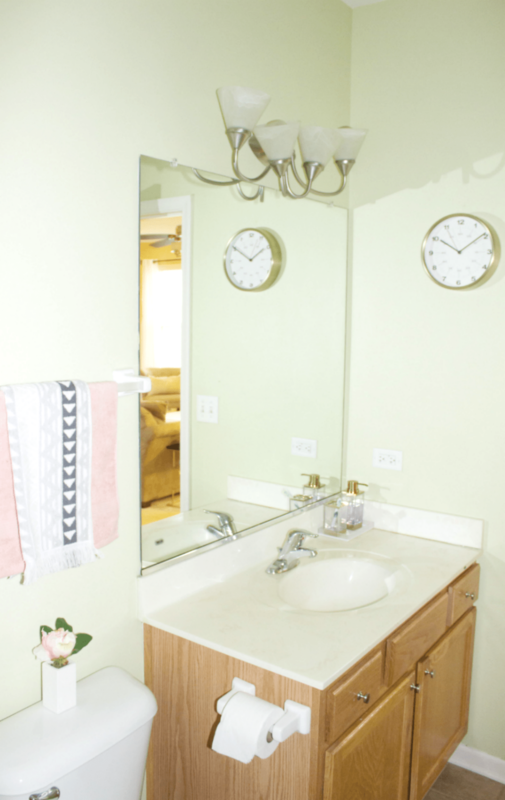 My bathrooms definitely could use a summer refresh. I had both bathrooms remodeled last year and I’m still searching for a few pops of color to finish it off. 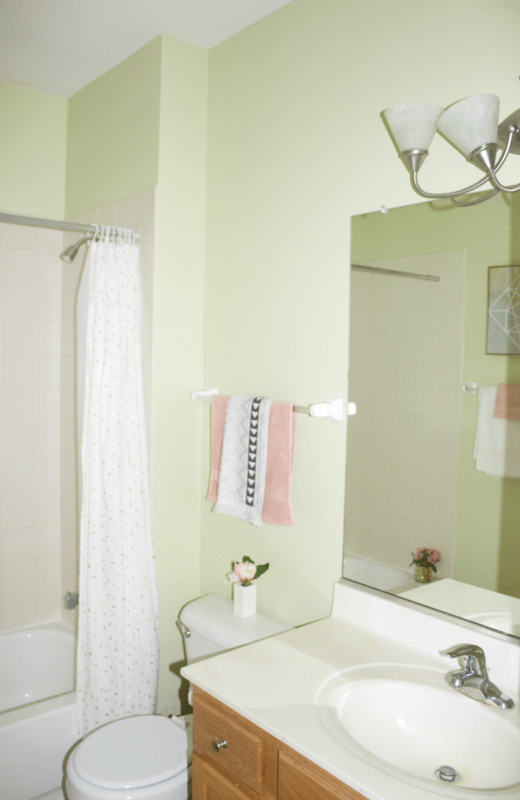 I’m with you – less is more when it comes to my bathroom decor and I love the simple ideas like changing out the towels. So pretty and fresh! Thank you Alli. I remember your bathroom remodels. Hope you find the pops of colors to finish them off!! Hey Kristen, the kids like to play with decorative things but not the ones in the bath since they only go in when they need to use it:) Bet your little ones want to explore everything around them!! All of this pretty stuff makes me want to redecorate my bathrooms. Ha, it was an easy refresh for sure!